Definition at line 435 of file AMDGPULibFunc.h. Definition at line 513 of file AMDGPULibFunc.cpp. Definition at line 440 of file AMDGPULibFunc.h. Definition at line 451 of file AMDGPULibFunc.h. Definition at line 446 of file AMDGPULibFunc.h. Definition at line 444 of file AMDGPULibFunc.h. Definition at line 931 of file AMDGPULibFunc.cpp. The mangled function name for mangled library functions and unmangled function name for unmangled library functions. Definition at line 453 of file AMDGPULibFunc.h. 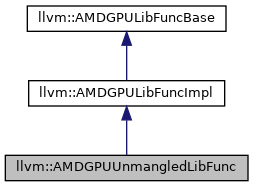 Definition at line 671 of file AMDGPULibFunc.cpp. Definition at line 455 of file AMDGPULibFunc.h.